The Holographic Versatile Disc, known as HVD, uses a collinear holography technology to hold even more than a CD, DVD, or even a Blu-ray disc – up to 1 terabyte of information, amounting to 200 times more storage than a DVD and 20 times more storage than a Blu-ray. And with a transfer rate of 1 gigabyte per second (125 MBs), HVD technology far outshines it competition. So with all these accolades why hasn’t HVD taken off? The technology has been around for years, but the precision required to use it has made it too expensive to put on mainstream consumer shelves. To start with the basics, holography is “the method of recording patterns of light to produce a three-dimensional object.” These recorded patterns are called holograms. The light is captured by using a split laser beam – divided into a reference beam and an information beam – which passes through an image. When the light hits an image it creates a “light interference” pattern. By capturing this pattern in a photosensitive polymer layer of a disc, the light pattern of the image is recorded onto the disc. The reference beam can be reflected directly onto the hologram to retrieve the stored light pattern. The image reflected off the hologram is sent to the CMOS sensor to recreate the original image. The patterns are stored in overlapping layers to maximize storage capabilities as opposed to side-by-side on DVDs. Primarily the technology has been too complex and with little-to-no adoption in the market, is relatively incompatible with current systems; HVD contain no servo data. Early HVDs were typically thicker than most CDs and DVDs. Optware, however, has made great strides to bring HVD to market. The laser beams system is simplified; now touch the recording medium at the same angle – the collinear method. And HVD discs now include servo data and are have been slimed down to be the same thickness as CDs and DVDs. Recycling programs have been in place in the United States since the 1970s. For the last 40 years Americans have continued to find additional outlets to recycle their electronics, including cell phones, computer batteries, and printer cartridges. And as the use of CDs gives way to MP3s, several companies, including Precision Disc Manufacturing Corp., are now providing CD and DVD recycling services. Unwanted CDs and DVDs as well as their cases can be sent to Precision Disc Manufacturing, a British Columbia CD and DVD duplication company, to prevent discs from ending up in landfills. Just pack your unwanted CDs and DVDs in a cardboard box marked “for recycling” and ship the box to or drop off the box at Precision Disc Manufacturing. You’ll be responsible for the cost of shipping, but you’ll have the satisfaction of knowing that your unwanted discs won’t go to complete waste. Precision Disc says there’s no problem with scoring or damaging the discs if you’re concerned about information security. Disc cases must be sent in a separate box, and all inserts should be removed. Mushkin Enhanced has officially joined the solid state drive game with the introduction of the Callisto series. With a read speed of 285 MB and write speed of 275 MB, the Callisto SSDs are high-performance competitors for the SanDisk and Intel solid state products. The Callisto series comes equipped with the SandForce SF-1200 controller and can be found in 60GB, 120GB, and 240GB storage sizes. Toshiba has been discussing the possibility of producing 3D memory for quite some time, but with a new factory set to open in Japan in 2011, rumor has it that 3D memory is just around the corner. The company’s fifth factory will not only produce conventional NAND flash chips, but will reportedly be Toshiba’s foray into a new 3D memory approach. 3D memory will address existing limitations by building both horizontally and vertically. Construction on the factory won’t begin until July, but Toshiba and SanDisk have reportedly been working on the 3D chips since 2008 in anticipation of this expansion. The Defender Collection from Imation, consisting of seven products, has been enhanced with new encryption and security management tools. Ranging from flash drives and hard drives to Blu-ray discs and removable tape cartridges, the Defender Collection comes standard with certification from the Federal Information Processing Standardization (FIPS) 140. Keith Schwartz, a director at Imation, calls this new series a first of its kind for the company. “We’ve never had products that have had the authentication levels we’re talking about, never had products that had antivirus, never had products with central management, and never had products that were validated at a FIPS level,” Schwartz said. The new products also include Imation’s DataGuard rf Tape Tracking System, DataGuard Transportation and Storage Cases, SecureScan for LTO tape cartridges, and DataGuard GPS (currently only available in Europe). “Secure ‘n’ Go,” a new series of products offered by Verbatim, features an enhanced USB products and SSD drive, addressing the need of professional and private users to secure data on mobile storage devices. 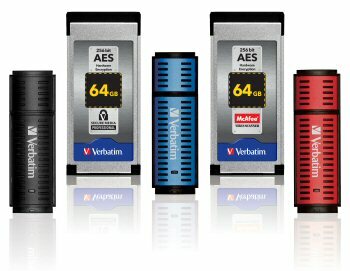 Verbatim’s Secure Data USB Drives and SSD ExpressCards offer industry-first AES (Advanced Encryption Standard) 256bit hardware security encryption and integrated password protection. The added feature on Verbatim’s new product line allows the user to implement a personalized form of data security via the Web. The SSD ExpressCard or USB drive can be registered online to activate the use of a lock, unlock, or erase feature. Remotely, from the Web, users can initiate “lock” mode, restricting access to the device by disengaging password entry, or “erase all data” mode in case the device becomes lost or stolen. And, Verbatim reports, the SSD ExpressCard is portable and convenient, fitting inside a laptop PCI ExpressCard slot. Other products in the series include: Solid State Drives, DVDs and Central Remote Management. Verbatim launched the products at the Infosecurity Show in London at the end of April and made them available as of May 2010.